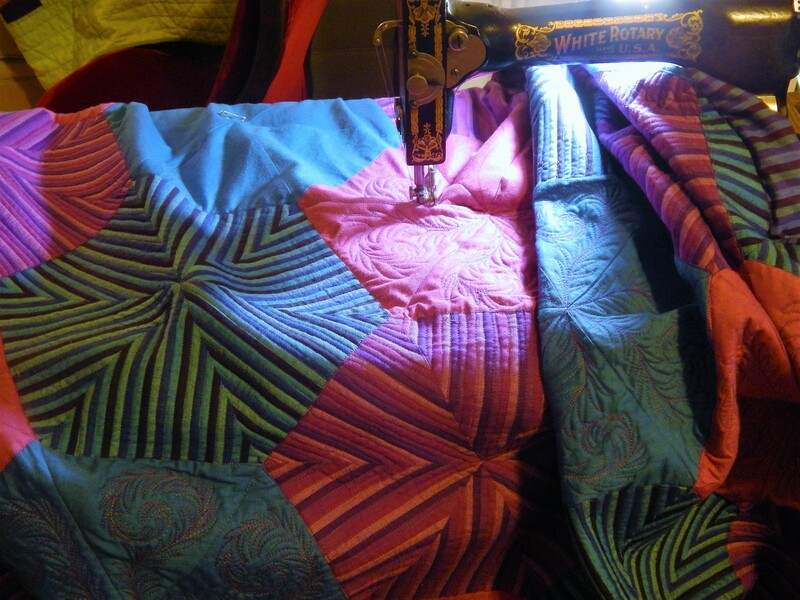 I have been busy working on the whole cloth quilt. (this one is going to take a while so I hope you don’t get tired of seeing it) I think I have gotten past my initial problems with the batik backing fabric. It is more difficult to quilt than muslin, but after a few days or working with it I have found that it feels normal now. I think my initial problem was simply that it was so different from the previous quilt. I have also found that I do much better and more even stitching if I wear glasses…..I have an appointment with the eye doctor next week but for now the drugstore magnifiers are working fine. 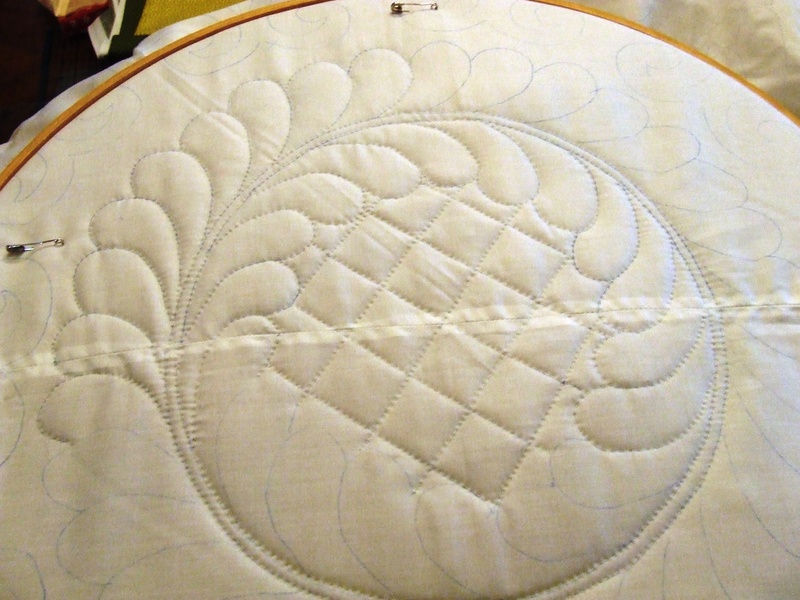 In the past I have only worn glasses to do applique, but it is helping on the quilting this time. I am quilting only what is marked for now ( the top was marked years ago by an unknown person when I bought it from eBay) once I get all that done I will go back and add a lot more. I plan to fill in the areas between the feathers in the center and double some of the lines…and add some more detail. I will make those decisions when I get there. Getting the basic quilting done first will make it easier to deal with because all the pins will be gone and I wont have to worry about bunching or puckers. Wow Tim, what ravishing quilting! Love it! Lookin’ great! Just think if you get a good pair of glasses how much more amazing your quilting will be!! LOL I do a lot more accurate work when I can see what I am doing! That is incredible! Another fantastic quilt in progress. This is so beautiful. I ann’t wait to see the finished quilt I now it will be wonderful. You sure quilt quickly! It’s looking great, too. Love the subtle batik you chose for the back, too. I bought the batik back at AQS and I had no Idea what I would use it for….but I love the look and even more love to find backing fabric that is wide so there are no seams! I went to the International Quilt Show in Houston last weekend. 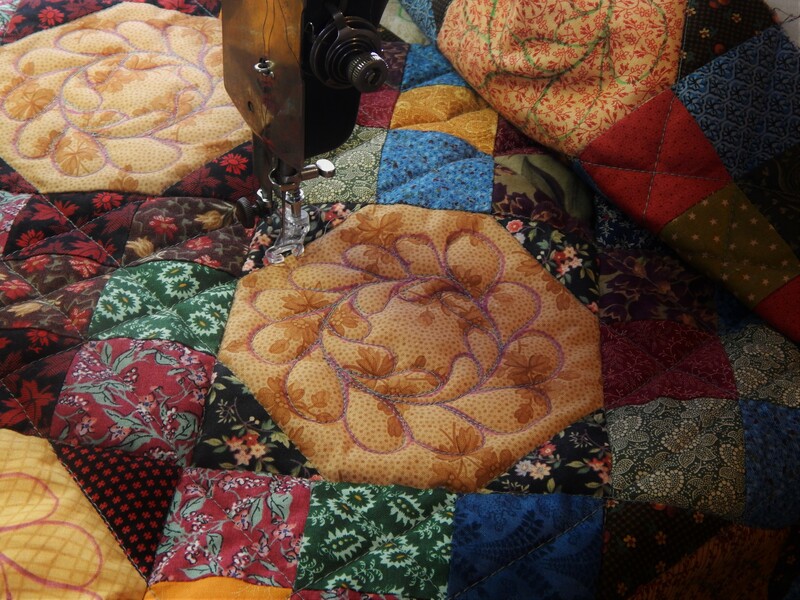 There seemed to be more whole cloth quilts this year OR I am just more aware of them after following your work. As always, this beginning quilter is very impressed with your quilting! Looking good! You’re making tremendous progress already with this one! This one is going to be so stunning! I can’t wait to see more. Have you got a good light by where you quilt? I find that if I have my Ott light on it makes a huge difference in how well I see. As we get older we need more light to be able to see well. I use my Ott light and also a light that has a 250W bulb in it. For a solid color the more light the better. I am enjoying your posts with all the pictures. Glad to hear you have an eye appointment. All part of the maturing process. Looks great! Glad you’re getting the hang of quilting on batik. I use it for most of my projects. Just recently discovered that needle size makes a difference. 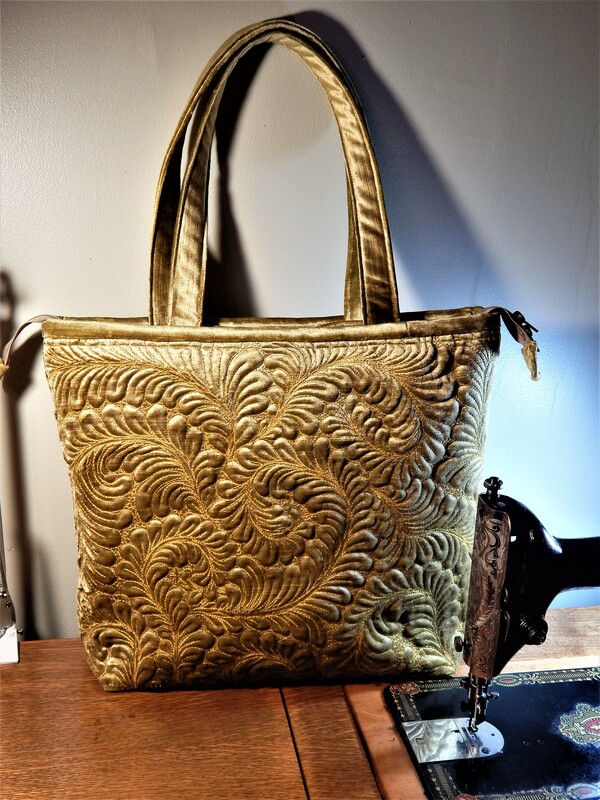 11 works best for me for batiks – small enough to glide through but sturdy enough for extra pressure. I’ve been able to go back to 12s for my current project which is a looser weave fabric.